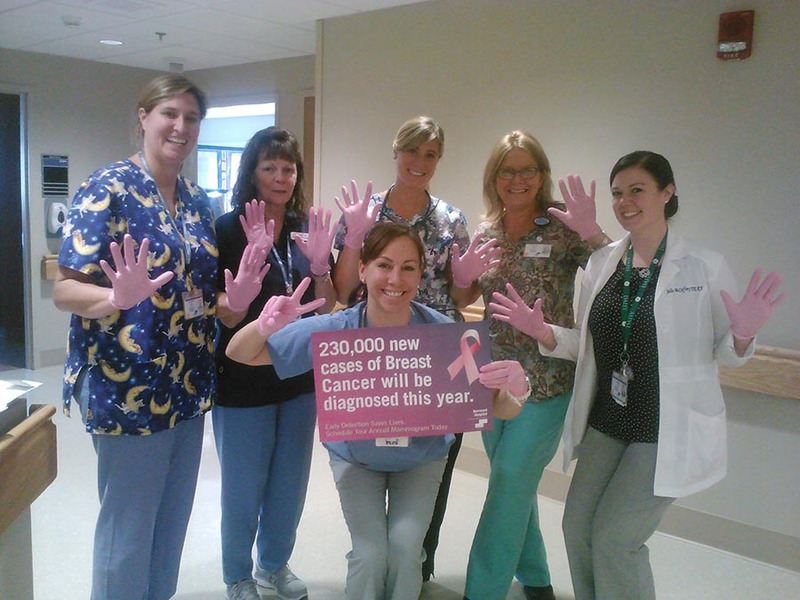 In recognition of National Breast Cancer Awareness Month, staff at Norwood Hospital are wearing pink exam gloves to raise awareness for breast cancer and the importance of screening mammograms for early detection. The gloves were purchased through Medline Industries, Inc., who began manufacturing and distributing the Generation Pink® Gloves to support its partnership with the National Breast Cancer Foundation® (NBCF). For each case of pink gloves sold, Medline makes a contribution to the NBCF to help fund and support mammograms, education, and prevention and awareness efforts. To date, more than $1.5 million has been donated. According to the NBCF, breast cancer is the second leading cause of death in women, and approximately one in every eight women will be diagnosed in their lifetime. Fortunately, these numbers have continued to decrease in recent years due to education and early detection, as well as improvements in treatment options and better methods of screening such as 3D Mammography which is now available at Norwood Hospital. If you are due for your mammogram, call the Guild Imaging Center of Norwood Hospital at 781-762-5595 x1 to make an appointment. To learn more about the hospital’s pink initiatives for breast cancer awareness, visit the Norwood Hospital Facebook page. Norwood Hospital is a full-service, 263-bed community hospital for adults and children with a focus on delivering world-class health care along with the latest advances in technology and treatment options. Norwood Hospital is part of the Steward Health Care System LLC, the largest integrated community care organization in New England which combines over 3,000 physicians, 10 acute care hospitals, managed care, insurance programs, home care, an imaging operation, and a number of other post-acute services, to provide the most cost effective and highest quality of integrated patient care. Additional information is available at www.norwood-hospital.org.